The role of a right hot tub cover lifter is imperative for any hot tub owner. It facilitates easy handling and also extends the safety and life of your hot tub. 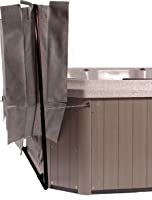 Moreover, with the right type of cover lifter, maintaining our hot tub becomes easy. 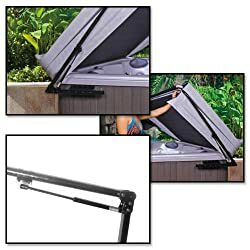 A cover lifter ensures hygiene and cleanliness to your hot tub and also significantly contributes to cutting down the electricity bills by stopping the heat from escaping. With the wide range of cover lifters available on the market, “what is the best hot tub cover lifter” can be a dilemma. High-quality powder-coated steel is used in to make it. Appropriately fits rectangular and square spas. No corrosion or rust over a considerable period of time. 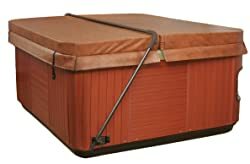 Not universal spa covers lift which can fit a spa of any size or shape. Meant for hot tubs only. Ensuring an effortless operation of your spa, this cover lifter from Blue wave is constructed with the highest quality steel to eradicate any possibility of rust and corrosion. It is a manual cover lifter which comes with a pivot style so that it could be mounted at the ground level. The side on which it is stored must have a space of around 4 feet to fold it back. With lesser space, removing or stowing of this cover is a hectic task. Effortless operation ensured by Hydraulic lift. Quite easy to install and use. The durable cover lifter with considerable quality. Additional support is required by some specific hot tubs. More clearance space required than usual i.e. 6” on the sides and 12” from behind. Featuring Reverse Pneumatic Technology (RPT), this technology efficiently assists you in the opening and closing the cover lift. It also ensures tight closure for insulation purposes, cutting down your electricity bills. Extended durability is provided by using high-quality aluminum and steel. Mounting brackets leads to easy installation. But you need to drill and fasten the tub cabinet with lift. Efficient spa cover removal is possible with gas spring. 5-year manufacturer warranty is provided. Goes well with all type of spas shapes with its under-mount cabinet design. High-grade aluminum is used to keep it corrosion free. Not suitable for vertical position. This cover lift facilitates easy installation with its under-mount base design. The spa of any shape – round, octagonal, square or rectangular can suitably be adjusted to this cover lift. No additional accessory required to attach to this cover lift cabinet. The powerful gas springs allow easy lifting and lowering of your spa cover. It comes with an adjustable height from 30” to 40” with XL spacers with 4”-6” tapers. If pricing is not an issue, this universal cover is a great deal to buy. Comfortable handling with its foam grip. Powder-coated rust free aluminum tubes ensure durability. 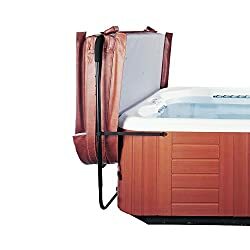 Can handle the spa easily up to the width of 96”. Towel hanging facility is available with TowelMate. Only meant for straight-sided spas, not work with round shaped spas. The cover only works with rear mounted brackets. Compatible with the spas with the width of 6ft to 8ft, it barely requires 5” of clearance at sides and 14” of clearance from its rear. This lifter is easily operable without mounting brackets. Spa Cover storage, as well as spa cover lifter solution, are available with this zero moving parts. No specialized tools are required for its installation over any hot tub. It comes with an R19 insulation value. Extended durability is ensured with Polyester Thread of Marine Grade. It reinforces the folding hinge and offers tear-free handles. Custom made changes are required for specific hot tubs. This is one of the efficient cover lifters, which handles heavy loads and harsh winters effectively. Durable yet light-weighted, it ensures good insulation. It comes with a tapered design with a foam thickness of 5”. The high-density form allows easy resistance from harsh weather conditions. It is a child-safe cover lift with 4 lock child safety. It can easily sustain the weights of children and animals, although it is advised to keep it away from them for safety reasons. Due to its compact size, it needs minimal spacing. Powder coated to ensure rust free and corrosion resistance. Comes with the deck and side mount. Does not work within ground and sunken tubs. Appropriate for rectangular and square hot tubs only. 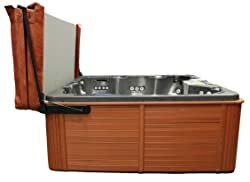 With a simple fold back, you can conveniently open this hot tub by using its pivot type lifting mechanism. Extremely light in weight, this cover lift is easily operable and it is effortless to uplift or lower it. High-quality powder coated aluminum is used to make it corrosion free. It requires a clearance space of 3” on the sides and 18” on the back. Hot tubes with maximum dimension up to 96” are compatible with this cover lift. A wide range of lifters is available ranging from back mount, side mount, bottom mount and under mount. You can choose an appropriate cover lifter depending on the installation of your hot tub. Always choose a cover lifter basis on the shape of your hot tub. Not all the cover lifters are compatible with all types of hot tubs. Due diligence is required to understand the appropriate requirements of your hot tubs and then try to figure out the best available cover lifter matching the preference criteria. There are many cover lifters which are designed to cater the specific tub sizes. A cover lifter too big for a hot tub will not deliver the efficient results as expected. In the same way, a small lifter will not fit the tub at all. Hence, a good lifter shall be considered after measuring the exact requirements of your hot tub. While some lifters require a clearance space up to 4”, there are many which need minimum space. So, due considerations must be given to the available space to pick a cover lifter which is perfect for your hot tub. In order to boost the efficiency of a hot tub and prevent any excessive heat loss, the role of a cover lifter is significant. The answer to the question – what is the best hot tub cover lifter, can be determined appropriately on the basis of factors like budget, dimensions of the hot tub and other preferences. 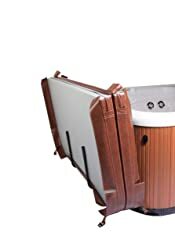 Each lifter comes with certain features, and it is important to understand the exact requirements of your hot tub to conclude a judicial cover lifter investment. The covers reviewed in this guide have been chosen after extensive research and analysis. You can consider any of these for your tub, just make sure they are compatible.